24 hours before you want to eat – season the roast on all sides with the salt. Wrap tightly in plastic wrap and place in the refrigerator overnight. Three hours and 30 minutes before you want to eat – remove the roast from the refrigerator and place on the counter to allow to come to room temperature. About 2 hours and 20 minutes before you want to eat – preheat oven to 225. Unwrap the roast and pat dry with paper towels. Rub with 2 tsp of oil and season all sides with the pepper. Heat a skillet over medium-high heat and sear meat until brown on all sides. 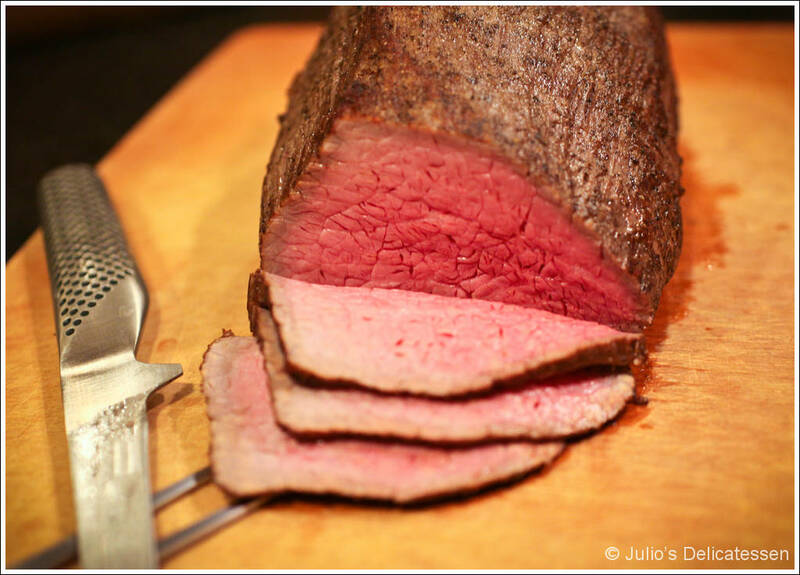 About 2 hours before you want to eat – place browned roast on a wire rack over a baking sheet and place in the oven. Roast until the meat reaches an internal temperature of 115 degrees (about 90 minutes). Turn the oven off, but leave the roast in the oven and the door closed. When the roast reaches 125, remove from the oven and rest for 15 minutes. Slice as thin as possible and serve.